The betta comes in a variety of brilliant patterns, colors and fin shapes. The betta splendens - those colorful little living jewels found in teeny, tiny cups in pet stores - are not, as the pet store chains would have you believe, found in mud puddles or watery footprints of oxen. They actually live in a large, biodiverse ecosystem in parts of Asia. Where in the World Do Bettas Come From? The betta comes from parts of Vietnam, Malaysia, Thailand and Cambodia in the river basins of the Mekong and Chao Phraya rivers. They are found in rice paddies and drainage ditches, river basins and small streams. This tropical region does not get very cold, only about 50 degrees Fahrenheit in winter. However, most of the year it is quite warm, with temperatures reaching as high as 104 degrees. Rainfall varies from very little rain in the dry season to daily torrential rain in the monsoon season. When being kept as a pet, a betta does best in a warm room or a tank with a small heater to regulate the temperature, keeping the water at about 73 to 80 degrees. They do not thrive in very cold water. Bettas live in rice paddies and river basins. Their natural territory is about three-feet square. The areas in which they live are relatively shallow and thick with vegetation. The streams are slow-moving and in the dry season can easily evaporate to almost nothing. When this happens, bettas are forced to live in shallow puddles where they can survive for a short time because, unlike other tropical fish, the betta has a labyrinth, or breathing organ, that allows it to get its oxygen from the air it breathes. Bettas are skilled jumpers and use this talent to get from a small puddle to a larger body of water. These puddles are connected by a network to larger bodies of water, and the water is always changing, keeping dangerous pollution at bay. When kept in tiny cups or little "betta bowls, " they can survive for a time, just like in puddles, but they will not thrive. The betta is an omnivore. It eats insects, insect larvae and plant material. In Asia, there is a huge variety of flying bugs that make for a consistently diverse diet for bettas. The larvae of midge flies, bloodworms, need water to lay and hatch eggs and are a readily available wild betta staple that's high in both water content and protein. Bettas also need fiber to keep things "moving along" so they avoid constipation, a common killer of household bettas. In their natural habitat, they get their fiber from exoskeletons of insects and plant fiber. The No. 1 question people ask about bettas is, "How do bettas mate in the wild without killing each other?" 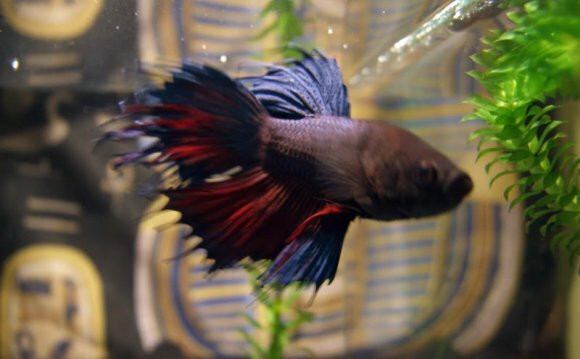 In fish keeping, betta owners are told that if they want to breed their betta, they need to remove the female immediately after breeding or she will be killed by the male. In the wild, male bettas create a bubble nest made of air bubbles and saliva. When an egg-bearing female betta comes sniffing around the nest, the male will wrap himself around her and squeeze out the eggs. He then fertilizes them and keeps them safely in the bubble nest as he patrols his territory. In the wild, the female hightails it out of there right after mating. In a fish tank, there's nowhere to run. Bettas are territorial, which is why they have a reputation for being "fighting fish." They are really just very good daddies who would fight to the death to protect their territory, bubble nest and fry.